Cech, with Sidney Altman, PhD, was awarded the Nobel Prize in Chemistry in 1989 for “the discovery of the catalytic properties of RNA.” Modrich, whom the lecture lecture honors, is also a Nobel Prize winner. A faculty member of the Department of Biochemistry since 1976 and a member of Duke Cancer Institute, Modrich shared the Nobel Prize in Chemistry in 2015 with two other scientists for "mechanistic studies of DNA repair” — a discovery that’s increased understanding of how the living cell works, the causes of cancer, and the aging processes. Before the Cech talk began, the chair of the Department of Biochemistry, Richard Brennan, PhD, presented Modrich with a commemorative plaque acknowledging the establishment of the lectureship in 2017. Modrich's former students and postdocs as well as friends and colleagues from around the world established the lectureship. 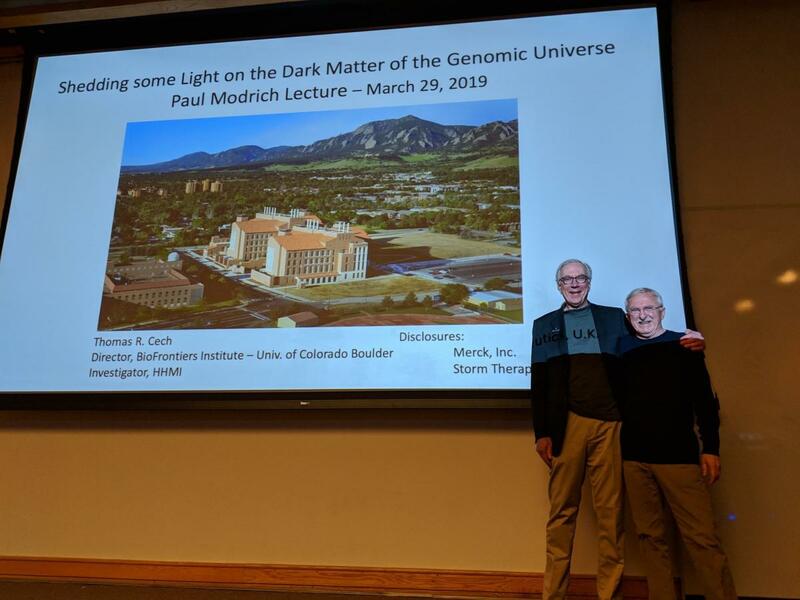 The Cech lab has also been a major contributor in understanding telomeres and telomerase function (there’s a reactivation of telomerase in 90 percent of human cancers) and long noncoding RNAs (incRNAs) — the “dark matter” which Cech went on to detail in his one-hour talk.